Its not often that the underside of the foliage is as interesting as the upper side, Cyrtomium macrophyllum with its large spore marks is a bit of an exception. Commonly called the ‘Large Leafed Holly Fern’ the foliage is heavily textural and adds real contrast to the fernery or in a shaded woodland positioning the garden. 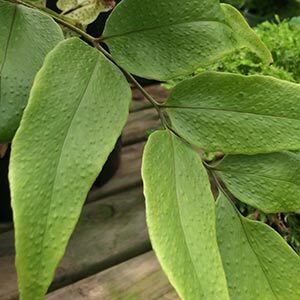 With a leathery texture to the touch, the foliage is a good light to mid green and divided. In heavily shaded areas, the distinct texture and the bright green of the foliage add a little light where it is often needed. Best grown in dappled shade to fairly deep shade this is a fern that requires a humus rich moist soil. Many gardeners choose to grow Cyrtomium macrophyllum in containers in shaded positions or in a fernery. Light to heavy shade – A little morning sun is OK, however hot sun will quickly scorch the foliage. Mulch around plants each year in spring after watering well. 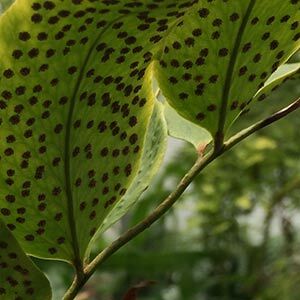 Cyrtomium macrophyllum can be tidied up in winter when old foliage begins to die back and look tatty. Simply prune right back in preparation for the fresh flush of growth in spring. Some gardeners wait until new growth commences before cutting back.